Your instructor, Sensei Steve Luce, holds multiple black belts in Ju Jitsu and Karate and teaches from the focus of defending yourself and those around you. Ju Jitsu uses efficient techniques to neutralize an attacker, often using their own force against them. Ju Jitsu utilizes joint locks, throws, strikes, holds, escapes and weaponry just to name a few of the techniques. 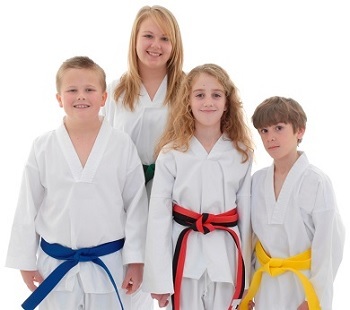 Tae Kwon Do builds coordination, self-esteem, confidence and strength. Tae kwon do means: "The art of Kicking and Punching" or "The art of unarmed combat". The sport has been founded in Korea and is one of the popular modern martial arts. The class welcomes children ages 8 and up and adults. Class runs month to month. Please register at the Courtesy Counter. Classes are held twice a week Wednesdays evenings and Saturdays and are one hour and 15 minutes long. Clothing requirements: sweat pants and plain white t-shirt. If you are not able to make the class, please call the instructor and let her know you will be absent. YMCA Youth member 8-15: $14/mo. YMCA Adult member 16 and up: $24/mo. Community Member ages 8 and up: $35/mo. Kitaku Kenpo is an engaging program that will instill practical Martial Arts techniques for children and adults within a safe and encouraging environment. Martial arts cover a broad range of activities that involve fighting techniques, physical exercises, and methods of mental discipline, among other skills. Martial arts originated in the ancient cultures of Asia, and are used today around the world for self-defense, exercise, health, spiritual growth, law enforcement, and athletic competition. Avoiding dangerous places and people, being a bad target, being aware of your surroundings, pre-attack indicators, how to prevent attack, self-defense vs. assault, body mechanics and distance, no means no, making your location known, care safety and complacency.